Tons of features, good performance and an unbeatable price make the Roku Streaming Stick by far the best value in the increasingly busy Smart-TV add-on category. If you already own a Smart TV—a WiFi-connected, app-enabled HDTV—you really don’t need to read this. That’s because the Roku family of devices (to which the Roku Streaming Stick is the latest addition) is for all of us poor shmoes stuck with TVs that have no way of talking to the internet and thus no way to access content providers like Netflix, Crackle, CrunchyRoll or YouTube unless we stretch a very long and trip-hazard-creating HDMI cable from our PC/laptop to our TV sets. Don’t laugh. People do that. For real. There is obviously a better way. It took a few years for electronics companies to figure it out, but simple WiFi add-ons are finally here. 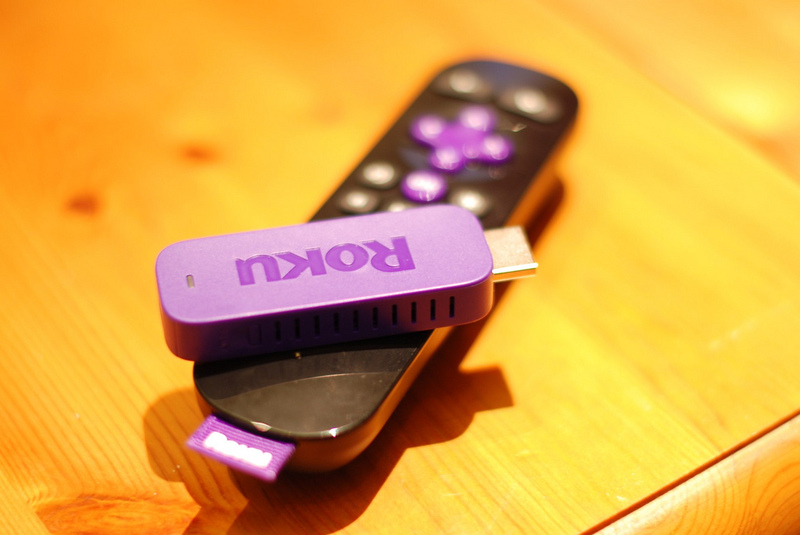 Roku’s Streaming Stick takes the best part of Roku’s earlier efforts, namely the amazing collection of hundreds of “channels” that give the Roku its ability to deliver streaming content, and pairs them up with a dead-simple receiver and an included remote control, all for the rock-bottom price of $59 CDN. 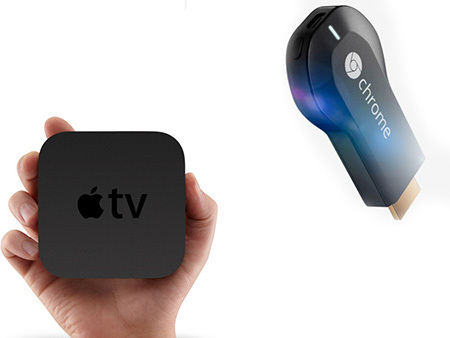 Google Chromecast Vs. Apple TV: Which is better and for what type of users? Now that Google’s diminutive WiFi media player is available in Canada, how does it stack up to Apple’s set-top box and which should you buy? It’s been several months since Google unleashed the Chromecast, a tiny dongle-like device that turns any HDTV into a Wi-Fi enabled display. Initially only available in the U.S., the $35 gadget was very well received and Canadian Reviewer’s Gadjo Sevilla found it to be an easy and reliable way to stream content to a TV. But if you wanted a Chromecast back in 2013, you needed to order one via the U.S. and frankly that was a hassle. Now that it’s being sold in Canada for $39, the time is right to take a look at this new player and see how it compares to one of the most popular devices in this space: Apple TV. Only in a world where one company has established a reputation not only for ground-breaking gadgets, but also the ads that promote them, can we legitimately write a tech post about Apple’s new ads. These aren’t just the latest ads promoting the new iPad or iCloud or the new MacBook Pro. Those ads have a very Apple-esque feel and are precisely what we’ve come to expect from Apple’s agency ever since they put the wonderful Mac vs. PC campaign to bed a few years ago. As the name suggests, these ads centre around the Apple Genius – the guy or gal at the back of every Apple store, clad in a blue t-shirt and sporting a distinctive silver doodad on a lanyard around their neck. Unless you’ve been living under a rock, you’ll know that these “geniuses” are the people you go to when you have an Apple-related question, no matter how big or small. Perhaps in an attempt to talk to those of us who have indeed been living under rocks, Apple’s new campaign tries to impart a personality to the otherwise nameless geniuses that staff their stores. But does it work? It’s hard to say. The campaign has kicked off with three new spots. The ads are funny, but not in the laugh-out-loud way that Mac vs. PC tended to be. The actor cast as the Genius is likeable – you can almost see the briefing to the casting director: “Find us Matthew Broderick.” Watching all three spots you can clearly catch glimpses of the famous actor from his roles in 1980s era classics Ferris Bueller’s Day Off, War Games and LadyHawke. Readers, what do you think? Has Apple kept up its reputation for top-notch advertising, or is this latest campaign a mistake the company should quietly (but quickly) walk away from? Update, August 7: Apparently Apple has pulled the Genius TV ads. Though their agency, TBWA/Media/Arts Lab claims the plan was always to give the ads a short run, clearly the overwhelming negative perception surrounding the spots was a big influence on their decision. I’m a sucker for remote controlled helicopters. They’re a blast whether you use them indoors to terrorize your colleagues or outdoors to terrorize your neighbours. But as cool as remote helis are, they don’t hold a candle to remote quadrocopters, or quad-rotors as they’re sometimes called. Especially when said quadrocopters are remotely controlled by a computer to execute a complex yet beautiful set of manoeuvres. Did I mention there’s also music involved? Check out this amazing video that demonstrates the potential of these tiny machines. The performance was created by Vijay Kumar and his team at the General Robotics, Automation, Sensing and Perception (GRASP) Lab at the University of Pennsylvania and presented as part of Kumar’s TED2012 talk. This group of engineers studies how swarms of robots such as these quadricopters can work together – sensing each other in real time and reacting appropriately. I’m not the first person to make the connection between this performance and the zany musical exploits of perennial YouTube favourites OK Go, and for good reason: each takes music performance to a whole new level. If you’re curious, do a few searches for quad-copter or quad-rotors on YouTube – you’ll be amazed at what you’ll find. These four-rotor machines are supremely maneuverable and can hover in one spot with a greater precision than a single-rotor craft. When we attended CES 2012 earlier this year, we had a chance to see the latest version of the Parrot AR.Drone, a quadrocopter with some unique features and a price tag that is within reach of most hobbyists: Approx. $300 USD. While not quite as powerful or precise as the models being flown by the team from GRASP, the AR.Drone is still a fantastic piece of robotic tech. Let’s just hope we never anger the computers controlling these flying machines, or we might be the next to be terrorized! For some reason, as obsessed as some of us are with the latest shiny gadgets from Apple, there are still others out there obsessed with destroying them for our amusement/horror. To highlight this phenomenon I give you two very different videos. Each goes about rendering a brand new iPad 2 – the same device that people are currently waiting weeks to receive in the U.S. – completely and utterly useless. Of course each goes about the process in very different ways. The first video gives us a highly stylized and somewhat John Woo-inspired treatment which renders the destruction almost poetic. The second is just a clown stuffing the device into a blender. Just in time for holiday gift-giving I suppose, Google has created a clever, tongue-in-cheek yet quite useful site for people who would like to play tech-support for their parents just a little less this year. Now, as you would imagine, Google uses the opportunity to promote their products and services but not to the point of being obnoxious and sometimes not at all: in the “Upgrade your browser” video for instance, Google chooses to use Firefox as their example instead of their own Chrome browser. The videos are short and simple – in most cases just an average guy or gal in their twenties demonstrating the tip without any kind of marketing polish so it’s easy to forget that Google is involved at all and you can just choose to focus on the content. That’s really the best part of these videos. Their plain-language content and minimalist style is approachable and won’t intimidate even the most skittish computer user. Even that task is simplified thanks to format of the email that is generated by the site: It’s stripped of any fancy HTML, presenting only some bare-bones text and an image and hyperlink for each video you’ve selected. No matter which email platform your parent is using, these emails will be easily opened and read. Finally, when your recipient is directed back to the TeachParentsTech website to watch their videos, they are given an option to reply to the person who so generously chose to send along these little tech tidbits. In a nod to turnaround being fair play, their options run the same gamut of kind or snarky so you can look forward to some amusing thank-yous.